What you eat is a reflection of how you feel – what story are your food cravings revealing about you? The ancient Greeks were firm believers that your emotions determined your state of health and what foods your body craved. 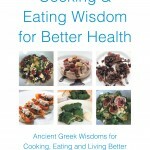 The ancient Greeks adopted a “wisdom eating” philosophy to restore health, harmonize the body and to spiritually connect with themselves and nature. Our cravings are our bodies crying out for nutrition because they are malnourished (i.e. eating too much processed food deficient in nutrients the body needs) or a cry out for an emotion such as love that needs to be satisfied. Emotional eating is using food to make yourself feel better i.e. eating to fill emotional needs rather than to fill your stomach and provide nutrients to the body. Cravings are often used as our coping mechanism to deal with emotional disharmony and to comfort us. Cravings can be satisfied in a healthy and nutritionally rewarding way by taking a walk, prayer, meditation, looking within or substituting ingredients and coming up with healthier alternatives. For example substituting white sugar with honey or petimezi (grape must/grape syrup) (you can read more about petimezi and how to make it in my book “Cooking & Eating Wisdom for Better Health” (BALBOA) – How the Wisdom of Ancient Greece Can Lead to a Longer Life) for healthier versions. In my book “Cooking & Eating Wisdom for Better Health”, I share how I too suffered from ill health for many years due to eating foods that did not serve my body well. The combination of not dealing with my emotional childhood abuse and my step-mother using food as a punishment lead my eating to be directed by my emotions. My emotions lead me to craving the wrong food choices, illness and weight issues. As soon as I detoxified my negative emotions and my body of the built up toxins my health was restored and my cravings disappeared. The extra weight came off and my weight harmonized. -Dehydration – you could be dehydrated and your body is sending you mild hunger signs. When you have a food craving; drink a full glass of water before you grab some food. -Emotional environment – when you are dissatisfied with a relationship, a friendship, your work or any other event or have unfavorable emotion such as insecurity, bored, stressed etc in your life then this affects your emotions by causing mood swings and directly impacts what you crave. They all contribute to emotional eating. We crave comforting foods because we are in need of feeling loved, safe and secure. Why not ask friends for a hug instead? -Lack of exercise – having an inappropriate exercise routine, too much, too little or the wrong type practice can also contribute to emotional eating. Eating may be used as a substitute for entertainment or to fill the gap. A craving may mean you simply need to go for a walk in nature to distress and relax. Instead, try meditation, pray, breathing exercises, or other stress-management techniques. – Hormones – when women experience menstruation, pregnancy or menopause, fluctuating hormone levels may cause unusual cravings. -Need for some sunlight – your body may be in need of some Vitamin D. Why not take a walk in the park or the beach? -Lack of sleep – your cravings may be your bodies need for extra sleep or rest. Sweet – having a craving for sweets could be indicating blood sugar fluctuations. It could be an indication that you are stressed and need to relax, a need more energy and that you are burnt out. When you have these cravings substitute the sweet cravings for healthier alternatives such as sweet vegetables like corn, sweet potatoes and carrots or choose wiser sweets such as dark chocolate or sweets that use sweeteners such as stevia, coconut sugar, date sugar, maple syrup or honey. My personal favourite is dates, dried figs, or a piece of fresh fruit. Salt – salt cravings could be indicating a need for more minerals. Instead of salty chips or salty processed foods substitute with a variety of vegetables, especially leafy green veggies which are high in minerals. A freshly squeezed green alkalizing juice with some spirulina is a great choice. Craving oily and fatty foods – these carvings could indicate anger and frustration about something or someone. They could also indicate an omega good fatty acid deficiency. Eat some raw walnuts, almonds, pumpkin seeds and sunflower seeds add some flaxseed oil, fish oil or hemp oil to your diet. Emotional cravings and hunger cannot be filled with food. It may feel good for that moment in time however the unharmonious emotions remain and you may end up feeling worse because the extra calories you consumed may have added a few extra pounds. Forgive yourself for the past choices that did not serve you and move on to create a new eating story. Adopt and ancient Greek wisdom practice of “Everything in Moderation” and “Nothing in Excess” (Oracle of Delphi). Engage with your eating and think about what you are about or eat. “Let medicine be thy food and food thy medicine” (Hippocrates) and “think good thoughts” (Oracle of Delphi). Adopt and “eat with peace and calm” (Aesop) approach. You may quickly decide that the food you are about to eat does not serve you or your higher purpose. Be still and listen to your soul and inner self. It is important when you have cravings to be still and to ask your body what does it really want and what is it really craving. Is it really food or are you dehydrated and need water? Does it crave food or is it an emotional need such as love that needs satisfying? Does it crave food or is your body in need of movement and stretching? Listen to yourself and trust what your inner guidance is telling you. “The natural force within each of us is the greatest healer of disease” (Hippocrates). Our inner guidance always knows what is best for us. “I am deserving of love and affection. I am loved and protected”. “I forgive myself for any past food choices I made that were unhealthy for my body and spirit”. “I love my body and I eat foods that nourish my body and spirit”. “I am a spiritual being and I eat foods with high vibrational energy that serve me and my higher purpose”.